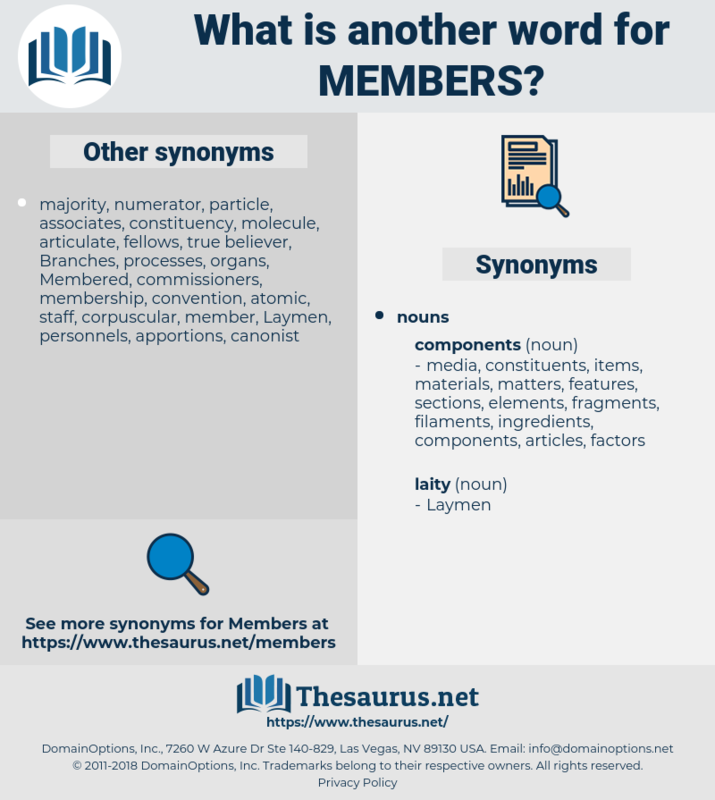 What is another word for members? 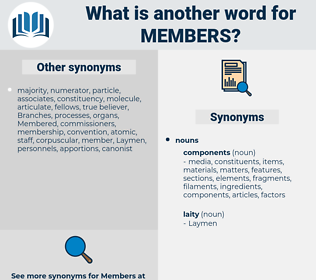 membros, parliaments, Friends, militaires, magistrates, players, independents, diputados, inspectors, rangers, citizens, attendee, militants, deputados, Families, Canadians, Communities, modules, justices, special, elements, components, commons, Respondents, Les, LINEs. me, messrs, honorable, vice-presidents, vice-chairmen, represented, Gentlemen, co-workers, distinguished, magistrate, servicemen, retirement, structure, adopters, mitgliedstaaten, administrative, stakeholders, elements, compositional, crucible, congressional, leaders, roma, workforce, consultant, Consultants, MAES, rep, commencement, Bernd, components, assistant, Militiamen, course, attendance, kauppi, beginning, commons, bundestag, clerk, armed, open, IYV, retired, senior, Patricia, some, liberian, federation, begin, begins, Respondents, rev, initiate, argentina, have, starting, related, initiation, prevention, development, consultancy, ukraine, prof, retreat, Consulting, seminar, district, dear, MLAS, points, employed, knesset, objects, auditors, AHR, hon., vice-, start, starts, Launched, category, THORS, NACHA, french, england, audience, Begun, russia, ward, Nawab, 100th, MDP, ep, Les, wednesday, floor, GNI, judiciary, park, c., uk, lab, gnp, IIAC, summit, senate, mix, NHAAC, wing-tat, STATS, map, NPC, CFA, judicial, chinese, please, CDW, ad, yiu-chung, class, let, tuesday, membre, MEP, LINEs. subscribers, supporters, years, sympathizers, observers, Researchers, managers, communications, collaborators, practitioners, believers, parlementaires, organizers, bearers, Congressmen, customers, suppliers, Beneficiaries, terms, matters, BRES, circumstances, peacekeepers, speakers, policyholders, prisoners, producers, reviewers, parliaments, shareholders, examiners, friend, Friends, belonging, professors, Measures, Recommendations, ambassadors, chairperson, chairpersons, legislators, barrels, porteurs, comrades, Originating, others, Trustees, Lawyers, Policemen, peers, militaires, recipients, magistrates, Administrators, Characters, fishers, boards, passengers, movers, contributions, entrepreneurs, manifestations, briefings, chiefs, neighbours, report, reports, Investigators, supervisors, Comprised, professionals, constituents, providers, pensioners, co-operatives, players, operations, CREWS, principles, provisions, executives, allies, journalists, users, Assemblies, distributed, negotiators, instruments, observations, entrants, followers, arrangements, arbitrators, gangsters, insiders, teachers, Environments, charter, substitutes, volunteers, inhabitants, sisters, organisations, headquarters, reservists, politicians, constituted, residents, times, signatories, enthusiasts, co-chairs, considerations, presidents, readers, frames, adherents, operatives, ingredients, defenders, personnes, destruction, borders, fighters, assistants, adjudicators, carabineros, relations, voters, companions, me, interlocutors, Gendarmes, accessions, services, initiatives, abstentions, Extremities, -rrb-, factors, composed, spectators, Siblings, Personalities, diplomats, Fishermen, reserves, Areas, Consultations, Negotiations, alternates, jurisdictions, Specialists, trainees, benefits, Nurses, specimens, victims, continues, applicants, Associations, asean, deliberations, partnerships, layers, citizens, appointment, consists, Subsidiaries, held, Survivors, outcomes, encourages, joining, professions, items, remarks, regular, regimes, activists, chairs, contingents, complainants, idiots, media, cooperatives, cooperation, numbers, sessions, Regulations, elected, Palestinians, presence, personages, sources, servants, allowances, commissions, women, airmen, experts, protocol, organisms, clearers, counterparts, Recalls, head, heads, interests, equitable, teams, panelists, centres, guests, militants, powers, compositions, frameworks, issues, commitments, Relatives, customs, Forms, occasions, connectors, Treaties, presidency, species, terrorists, exponents, names, coworkers, payments, cadres, nominees, contains, limbs, documents, Males, obligations, immigrants, guardians, Bodies, Charges, portfolios, procedures, strengths, scholars, Animals, Undertakings, ribs, proposals, promotion, Forests, patrons, interventions, template, onwards, integrated, Hearings, Branches, dependants, communication, provinces, waters, Bandits, Ones, Families, original, costs, Resources, nominations, republic, Minorities, buildings, assets, pillars, Sons, Sailors, leaderships, legs, Parents, athletes, institutions, morons, ways, movement, peoples, recruits, projects, Spouses, grand, electors, corporations, Governments, sitting, Counselors, values, authors, combatants, Firms, appliances, enquiries, folks, departments, features, subjects, Fees, Operators, lord, Clients, eyes, regions, Conferences, sites, Efforts, Children, concerns, Communities, notes, unionized, violations, quarters, segments, Rights, things, NATIONALS, ranges, Voices, Vehicles, questions, envoys, accidents, aspects, discussions, Pensions, Refugees, modules, Grants, mandates, shares, applications, enterprises, affairs, comments, Pupils, justices, police, conclusions, sets, priorities, welcome, welcomes, Populations, Businesses, decisions, Entities, amendments, appeals, technical, Duties, Donors, arrivals, Patients, figures, games, or, chords, phrases, symbols, guys, Households, Universities, Strains, actors, text, unionists, Languages, statutes, hands, ranks, Economies, topics, sections, kiev, Activities, instances, Schools, views, gangs, groups, positions, special, U, artisans, Faces, speeches, nine, OIOS, therefore, 65, circular, plans, acts, stages, levels, contacts, iraqi, situations, periods, prosecutors, places, series, Wolves, links, colleges, files, 53, requests, skills, who, bands, D, weapons, Companies, Has, reasons, Adults, NGOS, Vacancies, events, tensions, elections, options, results, functions, 2003, meetings, motion, Motions, vice-presidents, arts, sides, Agencies, Societies, inuit, sectors, compounds, funds, kosovo, 44, posts, VOTES, signs, amounts, Classes, 33, needs, spaces, 2008, paragraphs, total, 2004, 138, Gentlemen, Policies, tasks, Missions, 56, cases, offices, co-workers, opinions, 81, 1.1, Lives, date, accounts, servicemen, adopters, act, stakeholders, elements, Goals, leaders, roma, Consultants, components, Halves, federation, Respondents, have, MLAS, points, auditors, mix, please, LINEs. appropriateness, enrollment, individualism, roster, cross-section, strength, analyst, cabinet, figure, Militiamen, Les, extremity. Was, Were, Belonged, expressed, Recruited, included, lay, joined, adopted, felt. participates, comprises, includes, monitors, Gives, follows, continues, consists, needs. Constituencies, Students, Guards, unions, memberships. I love many of its members. We shall not part, for we are all members of the same body. maneuver, mopper, Manoeuvrer, manoeuver, minibar, mapper, manoeuvre, man-of-war, maneuverer, move over, mover, miniver, manipur, manpower.